Multplying integers is easy if you know a rule. Try it, try it! it will help you in school. First look at your question. Don't be a fool. Or else the only thing you'l do is sit there and droule. Odd or even negative symbols is the key. It's just like finding apples from a tree. Don't get mixed up with an order of operation. Or that will only lead to a wrong equation. An odd amount of negative integers equals a negative product. Now do the opposite for even and then you have got it! One more thing that I have to say before I leave. If you have no negative integers, a positive amswer you will reveive. How many equal parts go into 4 groups? Fill 8 karts, then group them with 4 loops. It's just like 4 armies with only 2 troops. Count each part in one group with your vision. 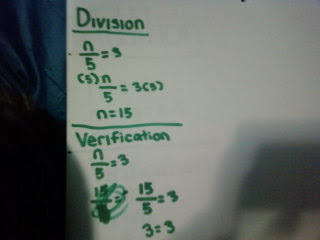 Now you have just done partitive division. How many groups of 2 go into 4. Draw 2 circles, than two more. Fill those circles in so positive they will be. That circle each group of two that you see. Count each group just like counting each prision. Now you have just done quotative division. I am not blind, I don't mind. Makes you feel sad because you lost. Hi Chicken what did you do today. Oh hi Santa, I just went to school. What did you do at school. First I had a math test. Then I had snack time. After snack time we had a science test. On the test, I got 1000 percent. Then we had nap time. Hold on. You never said anything about the your math test is there something wrong? No, it is just that i got two questions wrong on the test. I don't know what I did wrong. Can you help me. Okay! Tell me the first question that you had trouble on and explain what you did. Okay. The question is n+3-5n+12. 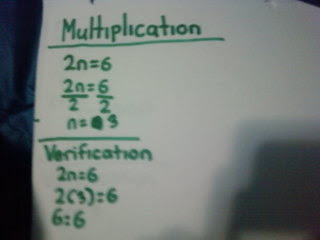 The first thing that I did was add the two n variables to get an answer of 6n. Next I added the 3 and the 12 together to get an answer of 15. 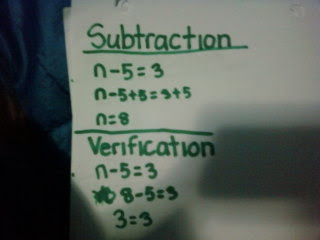 Then I brought the two answers that I got and put the subtracting sign in between them. This is where you went wrong. Instead of including the negative sign with the 5n, you counted it as an order of operation. To solve this question, the first thing that you do is circle all of the variables that you see including the positive or negative symbol with you variable. Next you have to add the variables together that match eachother. If you see an uh oh, just add the opposite. What is an uh oh. An uh oh is when a variable is subtracting a negative variable. What is the other question that you were having trouble in. The question was 2+4(3n+8). The answer that I got was 12n+10. The first thing that I did was multiply the 4 with the 3n to get an answer of 12n. The next thing that I did was add the 2 and the eight together to get an answer of 10. 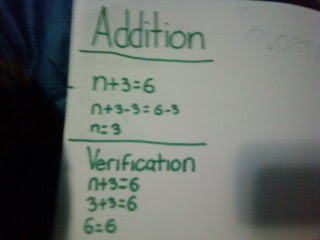 Then I brought down the two answers that I got and put an addition sign in between them. Here is where you went wrong. Instead of multiplying both of the numbers in the brackets then adding the 2 with the answer that you got that has the same variable as that one, you just multiplied one of the numbers in the brackets with the 4 and then adding the 2 with the other number that has the same variable as that one. Thanks Santa, now I know that on the next test that I get on math, I will for sure get 1000 percent. HI JAI! I'll start off this comment with the improvements you can do to make your post a lot better! First of all, you have a few minor spelling errors in your Rule for Multiplying Free Verse poem. My advice is just to read it over and identify the mistakes. Your second poem seems A-OK to me! So, KUDOS JAI! For your third poem, you forgot a question mark in the first line. The next poem seem alright to me, as well. Now, if I were you I would change the last poem's font colour, because it is kind of hard to read. I think your choice of colour (for the most part) for the font was chosen well, they compliment eachother nicely! Overrall good job, Jai! WHOA! It's so colorful! I like your poems. You did a great job. I found a few errors. For your first poem, I like how it rhymes. You spelled drool wrong you put droule instead of drool and you put amswer instead of answer. Third line, you should change than to then for your second line because it says draw 2 circles, than 2 lines and the one close to the end is it prision? Last poem, it's kinda hard to read maybe you should change the yellow to a not so bright color like red or blue or something like that. Hey, Jai! I loved your first poem! I really liked the way it flowed. And you post was so colourful too. I really liked that you titled every one of your poems and how you put every type of poem you did on each poem. But I found some minor errors. Some were spelling errors, or grammar errors. Others were punctation and capitalization errors. And also Or else the statement 'the only thing you'l do is sit there and droule' I think oyou mis spelled the word drool. The Great Big Book Of Algebra! The Great Big Book Of Algebra ! Thanks for the all the comments!